(T)he increase of known truths stimulates the investigation, establishment, and growth of the arts. The sun, with all he planets revolving around it, and depending on it, can still ripen a bunch of grapes as though it had nothing else in the universe to do. Galileo was born in Pisa (then part of the Duchy of Florence) Italy the first of six children of Vincenzo Galilei a famous lutenist composer and music theorist; and Giulia Ammannati. The Jesuits were offended and Grassi soon replied with a polemical tract of his own The Astronomical and Philosophical Balance under the pseudonym Lothario Sarsio Sigensano purporting to be one of his own pupils. He was tried by the Inquisition found "vehemently suspect of heresy" forced to recant and spent the rest of his life under house arrest. 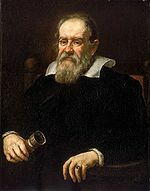 Galileo Galilei (Italian pronunciation: [ɡaliˈlɛːo ɡaliˈlɛi]; 15 February 1564 – 8 January 1642) was an Italian physicist mathematician astronomer and philosopher who played a major role in the Scientific Revolution. It was while Galileo was under house arrest that he wrote one of his finest works Two New Sciences in which he summarised the work he had done some forty years earlier on the two sciences now called kinematics and strength of materials.